Welcome to Day 2 of MAWC2019! On Day 1, the Shopping Annuity was front and center for all of the presentations. With all of the enhancements and updates, make sure to read the Day 1 recap to stay up-to-date on all of the changes. Day 2 marked the return of JR Ridinger to the stage and he did not disappoint! For a recap of Day 2, keep reading. Marc’s goal for today is to make the MPCP richer and more lucrative than ever before. Yesterday was about BV. Today is about IBV and building an IBV machine. It all starts with the generic products for Super IBV. There is no cap on these products. You can order as many of these products as you so please. Super IBV and MA products can be shipped in one box. All of these products can be added to your UnFranchise AutoShip. It’s Marc’s mission for UFOs to earn more IBV from the thousands of Partner Stores and make more money through the IBV compensation plan. At MAIC2018, IBV numbers significantly doubled for all Partner Stores and that’s only the beginning. Marc made a bombshell announcement in regards to the Shopping Annuity Brand products. Before, you can only earn BV on these products. Now, you can receive IBV on these products (up to 57%). It will be your choice and it will start at the end of February in the United States and will continue to roll out in the following global markets once the Shopping Annuity Brands show up there. Up until now, the maximum amount of IBV you can select on MA products was 50 BV. Just like IBV was doubled on SHOP Local and Partner Stores, the same thing will happen with Market America products on UnFranchise AutoShip. Effective February 28th, you can place 100 IBV of the Shopping Annuity Brand products on UnFranchise AutoShip. 100 IBV for AutoShip Orders plus 50 BV for regular orders equals 150 IBV per month, which is 3x more per month! All of this increased IBV well have a major impact in qualifying as a Shopping Annuity Master Member (SAMM). To become a SAMM, a UFO needs to do the following: complete the SA Assessment, purchase 1500 in personal BV per quarter, purchase $3000 per quarter from Partner Stores, SHOP Local, eGift Card Center, and OneCart Stores. Marc said that “this is changing today. We’re improving the SAMM program so you’re focused on the earning part of the SAMM, not the spending.” The SAMM is changing from $3000 spend per quarter to a 300 IBV per quarter so you can focus on spending IBV. The new SAMM program starts April 1, 2019 in all countries (IBV minimums will vary in every market.). With the change to 300 IBV you have more choices to satisfy the criteria. You can still purchase from Partner Stores, eGift Card program, OneCart, and SHOP Local to count towards you 300 IBV minimum. Super IBV, Rastelli bundles, Restaurant.com, and the Shopping Annuity Brand will also count towards the 300 IBV minimum. From there, Marc explained how to convert products you already use to the Shopping Annuity Brand. These brands will help you hit the IBV minimum at a faster rate. Marc’s presentation showed how a family of 2 can easily earn over 500 IBV per quarter and that’s not including kids and other product categories such as office supplies, special events, and travel. Marc then introduced a new travel program titled UnFranchise Premier Travel, which is now live. The “Travel” section is under the “Ordering” tab on UnFranchise.com. This program can potentially give significant discounted rates on hotels. Soon, flights and rental cars will be added to the program. What’s great about this program is UFOs will receive the IBV rewards within 24-48 hours of booking, which will be around 11% IBV. Marc invited the President of SHOP.COM Steve Ashley to discuss the fourth component of the Shopping Annuity, which is technology. Steve started to discuss the enhancements to SHOP.COM such as focused search results, which will single out top brand names to the top. The ambassador’s choice badges show the top selections from SAMM members, which can be very advantageous to UFOs. Updated stores pages contain more details and more products. Steve continued to discuss updates to SHOP.COM. Previously purchased items will be seen on product pages and can soon be added to your AutoShip. SHOP.COM Customer Review Responses were added so that the SHOP.COM can directly reply to comments and answer questions and clear up any discrepancies. Marc came back onstage to close the presentation with positive stats about Market America and SHOP.COM. In the Internet Retailer World’s Top 100 Online Marketplaces, SHOP.COM is now the 36th online marketplace. Switching gears, Marc mentioned how the legal team has been working to remove the illegal sale of products on third party gaming and auction sites. To counteract that measure, the company decided to build a Market America / SHOP.COM Amazon store for two reasons: 1) It would push unauthorized sellers off . the sites and 2) Returns any customers that you might have lost. The Amazon store opened in December and the eBay store should be opening within six months. When an order is placed on this store, if that customer is tied to a UFO, the UFO will receive the BV and retail profit from that order. Then, Marc announced that Brazil has been added to SHOP.COM Global, which means you can build customers in Brazil and have products shipped there. All BV gets credited to your home country. Speaking of global markets, the Southeast Asia Convention is now sold out in April. Plus, coming soon, the next market that is coming soon will be Thailand. Marc also said that he can’t promise that this market will be added, but he will do his best to potential bring in China as a global market. JR said he’s going to do his second favorite thing in the world, which is how to build the business. Think of this presentation as a therapy and strategizing session. JR explained how there are new UFOs who are struggling in this business and he wants to help. If this is you, take the UFO Health Check, which are questions you can answer to explain how you are struggling and how the company can fix it. 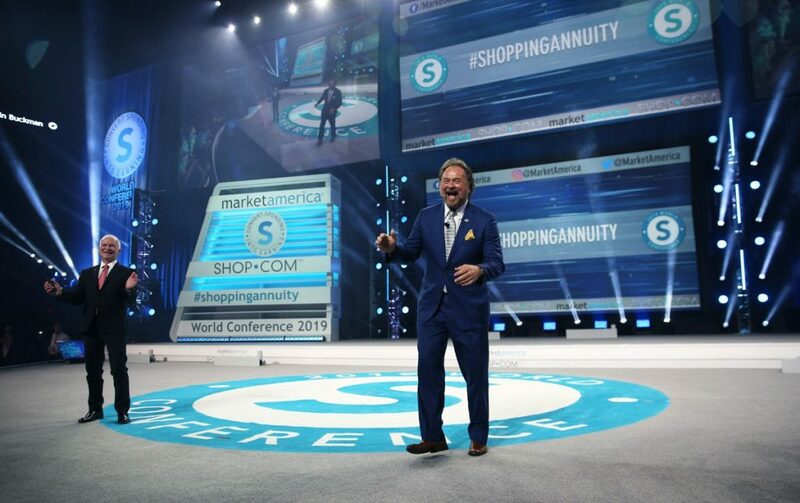 Over 40 years, JR has been through four different organizations and the fourth time was the charm because that organization was Market America. You only need two people to get started in this business. JR said, “If you put me anywhere in the world, I will find people to succeed in this business. The only way that I guarantee that this business will work is by following my way to do it.” JR does not recruit people for this business; he qualifies people. Don’t talk about the themes of the business as a way to recruit them. Talk about these themes as a way to start a conversation. People love to talk about themselves. Listen to them and build a relationship in order to collect information on their lives. Figure out their complaints and use them as reasons to bring them into the business. To begin recruiting, start out by creating a list of 100 people to call. All you need to do is two per week. These beginning calls are to see if these may be the right people for the business. There is no threat or intimidation. Keep it informal and relaxed. Present it as an entrepreneurial opportunity. If you do 2 per week, you will end up with 8 Go Nows. JR states that sometimes, it’s not your fault that you struggle in the beginning. Sometimes, your sponsors let you down. JR wants to let you know that he forgives you. JR says that “timing is everything. For you, the prospect, and for everyone in your group, timing is everything. The right ones will rise to the top.” Practice and experiential learning are the only things that will make you great. You need to practice when nobody is looking. Then, you need to practice and preach the business a lot so you gain experience. To explain this principle, JR used the example of the bean jar to show that as you shake the jar, the nuts rise to the top. The UnFranchise Business has the vertical plan because you only need two legs of the business. Two legs can make more money than 10 in a regular franchise. How can everyone sponsor 8 in a year while activation only requires 2 qualified UFOs? It is a misconception! To explain this misconception, JR used the pump example to further his point about activating your business. The MLMer Networker had to prime 10 pumps separately at once in all competition to make the same money as 2 Binomial Pumps. It’s too difficult to duplicate. That’s why in a vertical plan, it’s easier to prime two pumps and the rest will duplicate. Your prospect must see the plan three times before signing up. If they qualify, they get a trial run. Your prospects are either ducks or chickens. They learn to fly and become geese or they don’t fly and become chickens. They grow in the business or they don’t. JR also has a new word for duplicating. It’s called “imprinting.” It’s the greatest secret and discovery in the business that explains everything that has happened. It’s found in Fowl. The babies copy the mother, imprint the mother’s actions in their brain, and eventually use what they learned when the grow up. JR invited a few UFOs onstage to showcase how mother chickens lead chicks during their formative years just like UFOs lead their recruits during their beginning stages. UFOs can fall in the middle of chickens and geese and become ducks. These are stable UFOs because they do learn how to fly. However, geese are more eloquent because they can fly in formation for miles with big wings. Geese don’t know how to be a duck and a chicken. They only know how to act like geese. JR said, “In this business, if we do it like a goose with 100 names, 2 calls a week, and show it to recruits 3 times, then you are acting like a goose. You keep flying and build your flock until you fly in formation.” You always go back to the way you are brought into the business. If you are brought in as a goose, you will be brought in the right way. The key question the executive sales team needs to solve is the “how.” The solution to the how is the MBBW. The MBBA was created to implement and execute the “how.” These sessions identify the 20% of the activities that generate 8-% of the BV. It will establish a 90-180 day sprint to duplicate. The end result is discipline and entrepreneurship. You should build two or more organizations generating 5000 BV per week. The MBBA starts out with defining your “why” by listing goals, both intermediate and long-term. From there, you will create a goals and action plan to help achieve your 90 day goal. This sets the foundation for a success story. The foundation includes becoming a product of the product, product of the program, leveraging the GMTSS, developing tiers of leadership, and building event to event. One way to build on your foundation and the Base Ten is through trial size marketing, where people will be more likely to buy the products when they’ve tried them out. After acquiring customers, it’s time to build a portfolio of your best customers. UFOs can create leverage with the “7” Strong. This is where wealth begins. The 7 Strong includes call workshops, mastering your approach, qualifying to recruiting, following up, and the ABC Pattern of Building Depth. Both Kevin and Dennis said that this is “where the money is at.” The duo closed by saying to look out for the upcoming MBBW schedule and to attend an event in your area!